Signed l.r. corner, pencil "GWLambert". Not dated. Andrew Yip, Look , ‘’A wonderful setting for the tragedy’: an artist captures an Anzac horror’, pg. 10-11, Sydney, Mar 2013, 10-11 (illus.). Lambert Memorial Exhibition , Sydney, 1930. cat.no. 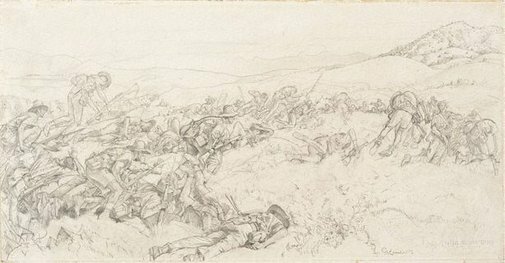 92; titled 'Cartoon, Tenth Light Horse at the Nek, Walker's Ridge, Gallipoli'.